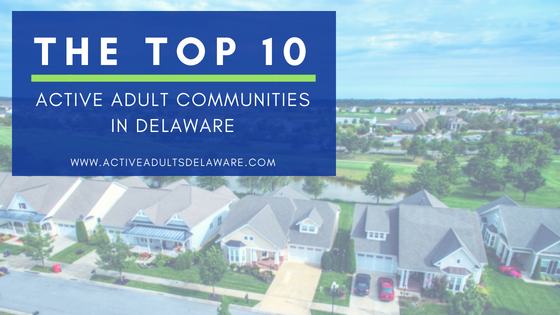 A host of new communities are coming to market in 2018 and that creates a buzz and a wave of new inquiries about relocating to Delaware. There is always a lot of excitement when a new community is announced. Not all the top sellers are new construction only. In fact, some have realized that an existing home in a hot community might be a better value than new construction in this market. The good news is your Active Adults Realty agent can help you evaluate the options and make a good decision about what is best for you. Heritage Shores is the largest active adult community in all of Delaware, and one of the few with both an indoor and an outdoor saltwater swimming pool. Heritage Shores also has a championship golf course, 4 separate tennis courts, and 4 separate pickleball courts, multiple restaurants, a well-equipped Fitness Center and an extremely active group of residents. When complete, there will be up to 1800 homes in Heritage Shores. To date, there have been 567 settlements. New construction single family homes are available from two builders and there is typically a good selection of existing homes for sale including single-family and attached homes at very competitive prices. Heritage Shores is home to many retired veterans and has an extremely active Military Club. And, there is a full-time Activities Director that does a great job of keeping the Event Calendar interesting and diverse enough to appeal to all residents. Independence is a luxurious active adult community of all single-family homes that continues to offer new construction homes with a choice of models to be built as well as some excellent values in existing homes for sale. Not only does Independence have both an indoor and outdoor swimming pool, but there are saunas as well as showers in the locker rooms. The addition of two dog parks, one for small dogs and one for larger dogs, as well as the Community Garden several years ago, have been very popular with homeowners. A new section of premium wooded and water view homesites has just opened if you prefer a premium lot. Bay Crossing is a smaller active adult community with a Lewes address that continues to sell well despite all the new construction in other communities. It’s all about location and Bay Crossing has easy access to Lewes, the bike paths, Cape Henlopen State Park and Lewes Beach. When a home does become available, you need to be prepared to move quickly or it will be gone. Age restricted communities are not as prevalent in Sussex County due to its reputation as a vibrant second home and vacation home market. We have more “age targeted” communities offering the style home, amenities and services that retirees are looking for along with easy access to the beaches and resort towns. Villages at Red Mill Pond is an age-targeted community now being built by K Hovnanian. Prior to the crash, NV Homes was the builder, but then it all came to a halt for several years. As the market recovered, the developer brought in K Hovnanian and sales have been brisk ever since. Now, there are only about 25 lots remaining and some of them are premium lots. Bishops Landing is another fast selling community located in Ocean View, only a short distance to the beach in Bethany. Homeowners love the location, the beautiful clubhouse, amenities and active lifestyle. Beazer is now building Quick Delivery homes on the remaining 10 lots. Don’t miss out, contact your Active Adults Realty agent today. With the delayed Spring, we are busy, busy, busy. There is going to be another phase but it will not be ready for delivery until 2019. Coastal Club may be breaking all the records, selling faster than even Senators and Four Seasons Silver Maple. It’s hard to keep up, but we do know this – there are only 30 single family home sites to be sold and delivery is 1 – 1 ½ years out. The situation is somewhat better for twin homes with 43 sites remaining to be built and some possible Quick Deliveries. If this community is of interest to you, let your Active Adults Realty agent help you compare this with other opportunities we know of this year. Senators was the very first new home community in the Lewes area to open as the real estate market recovery began in September 2012. Projected to sell over 6 years, Senators sold out in 2016, 2 years early. In fact, it was one of Active Adults Realty’s clients that purchased the last new construction home. Property values at Senators have increased and demand is strong. Buyers love the location with access to the Junction and Breakwater Trail, proximity to Lewes, the beach and parks. No weekly rentals are allowed at Senators so year-round residents and retirees know their neighbors and enjoy an active social life. Longacre Village in Dover like the Villages at Red Mill Pond had been started by other builders and developer but ran headlong into the real estate market meltdown. When the dust settled and a new developer took over, K Hovnanian Homes was brought in to build out the community. With a good mix of attached homes and single-family homes, the community sold out. The location, just southwest of Dover, the capital of Delaware, provides easy access to Dover Downs, Harrington Raceway, Dover Air Force Base and a short trip up and down the state. Four Seasons Silver Maple is one of those communities that was in the right place at the right time. It sold out more quickly than even some of the most popular communities at the beach and proved that people move to Delaware now for many reasons. It continues to sell well when resales become available and its success has paved the way for the new Four Seasons at Baymont Farms coming soon to Middletown. Ponds at Bayberry is the newest 55+ active adult community in Middletown and sales are “brisk”. The community continues to take shape and the clubhouse & pool are almost complete and set to open soon. Stay tuned for information on the Grand Opening. Construction has begun on their “New” townhomes and there are some fabulous incentives for the first few buyers. If a single family home is what you are looking for, they have some very nice private lots available NOW. Call us today for details! We highlight many more communities, some just beginning construction, some offering a mix of both new and existing homes for sale and others that are resale homes only. Keeping up to date on all of them as well as the complete factual data you need to properly evaluate your purchase is a big part of our job at Active Adults Realty. Our team of agents work together and share information and experience and that benefits all of our buyer clients. To keep in the loop with all that is new and upcoming, be sure to subscribe to our Neighborhood and 55+ Community Update newsletter.